Since its introduction on 1 May 2014, more than 12,000 domain names have been registered under the .KIWI domain which has become new online namespace for New Zealanders. The .KIWI extension is the only generic TLD which has been formally approved for New Zealand. It has gained popularity with individuals and companies, many of whom have bought .KIWI domain names in order to personalize their websites and email addresses. 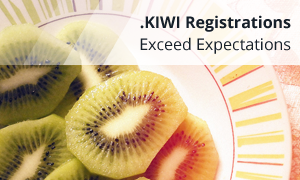 As a fairly young domain, .KIWI is still in its beginning phase, but it is growing fast and the number of registrations within the extension has exceeded expectations. .KIWI is a meaningful alternative to .COM or .NET domain names, and it ranks 25th for worldwide sales. .KIWI domain names have been adopted by numerous important organizations, non-profits and personalities in New Zealand, including telecom companies, sportsmen, actors and others, that wished to show their affiliation with the region and its culture. The growing interest in the registration of .KIWI addresses has also led to an increase in sales for New Zealand’s country code domain .NZ. As one of the first generic domains that have been dedicated to connecting people with their geographical and cultural identities, .KIWI allows customers to personalise their online identities and offers more naming choices than legacy TLDs. The .KIWI domain is available for registration to the general public and is a great choice for anyone who wishes to show off their affiliation with the Kiwis. To check if the name that would suit your needs is available, click on the domain of your choice and type your chosen domain name in our search tool. If you need assistance, please do not hesitate to contact us by email at support@web-solutions.eu or via phone on +44 (0) 208 133 3994.